1. Log in to Moodle and click on the course. 2. Click on the link to the quiz within the course. If you click on the link to the Quiz before the time it opens, you will see a message that lets you know the Quiz is not yet available. If the deadline to take the Quiz has passed, you will see a message that lets you know the Quiz is no longer available. 4. 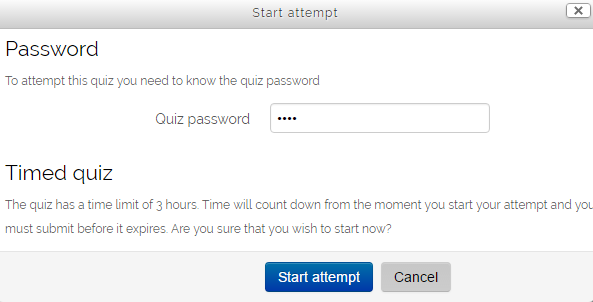 If a time limit has been set, the time does not start until you click the Attempt quiz now button. NOTE: Once you click "Attempt quiz now", the time starts. Even if you close the browser and come back to it later, the timer is still going. Once the time expires, your attempt will be closed. 5. Click the Attempt quiz now button to begin the Quiz, and enter the Quiz Password, if required. A pop-up window will appear notifying you of the time limit and asks if you would like to proceed. Click the Start attempt button to proceed. 6. Questions may appear all on one page, or across several pages depending on how the instructor has set up the quiz. If you have any questions regarding these settings, please contact your instructor. 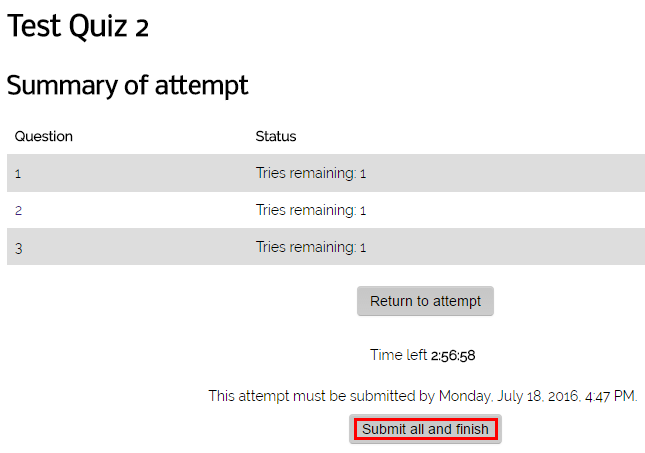 You will notice a Quiz Navigation block on the left that indicates the number of pages and the time remaining for the attempt. Once you are finished answering a question, click on the Next button at the bottom to go to the next page. Some instructors set the quiz to allow you to go back and forth between pages and questions, but some may set it to "sequential" meaning you cannot go back and forth between questions/pages. Click Finish attempt... when you are finished answering all questions. 7. Click the Submit all and finish button at the bottom of the page once you are finished and ready to submit the quiz. 8. Once you submit the Quiz, it will be graded and results will go into the Moodle Gradebook or within the Quiz itself. If any Essay questions were included in the Quiz, they will be marked as "pending" until they have been manually graded by the instructor. Depending on the Review Options set by the instructor, you may be able to click on the quiz once it has been graded to see which questions you missed, the correct answers, and any feedback. If you are unable to view these review options, please contact your instructor to notify them.